The circus can be breathtaking, spectacular, an incredible showcase of superhuman feats that traces its roots back to Ancient Rome when chariot races and equestrian exhibitions were held an open-air “circus”. Since the genesis of modern circus in 18th century Britain, shows have come to include extraordinary displays of acrobatics and contortion. Contemporary circus as we know it can be completely awe-inspiring – but Australia’s Circa wants to inspire more than awe. A visionary company from Brisbane, Circa is continuously stretching and pushing the limits on what circus can be. Looking as much to theatre and dance as to traditional circus, its work emphasizes movement and effect over spectacle. From Human’s celebration of the power of bodies, to Il Ritorno’s interpretation of the search for refuge, the artists and acrobats of Circa are deliberate about framing each trick to avoid issues of double focus: when attention is split between watching the movement and observing its virtuosity. In many ways, this approach is akin to that of modern dance. 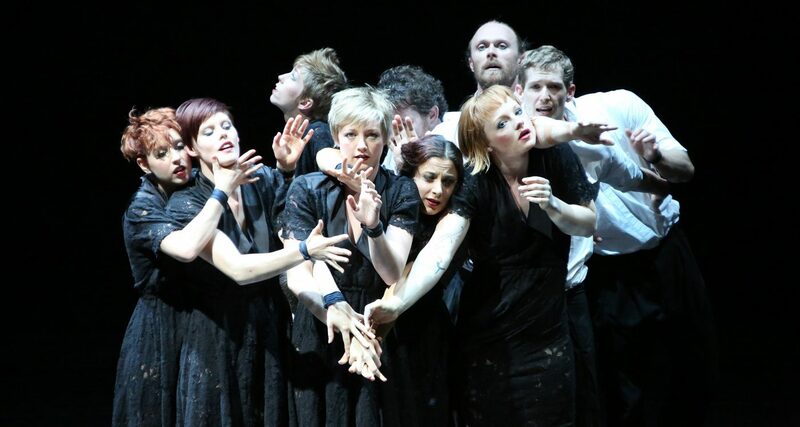 Where a dancer in a Pina Bausch piece might fall to the ground in a repeated, punishing gesture, Circa’s performers will cross the stage on collapsed toes, sparking unease and distress among audience members – reactions beyond simple admiration. These are the reactions Circa values, and the reception that fuels this rebirth of contemporary circus. Circa’s choice of material runs the gamut from the animal kingdom to the life of Mozart, though the group seems especially drawn to material associated with modern dance. The troupe’s most recent creation is a new take on Stravinsky’s Rite of Spring. The work famously started a riot at its 1913 premiere for music and choreography that was paradoxically both primitive and upsettingly modern. Since then, it has been imagined and reimagined by the likes of Vladimir Vasiliev, Pina Bausch, and Martha Graham, always with this dichotomy in mind. What could be a better jumping-off point for the re-imagining of the circus? Adding yet another layer of innovation, Circa collaborates with musicians to create complete works of theatre where the brilliance of circus mixes with the sophistication of classical music to elevate and invigorate both forms. 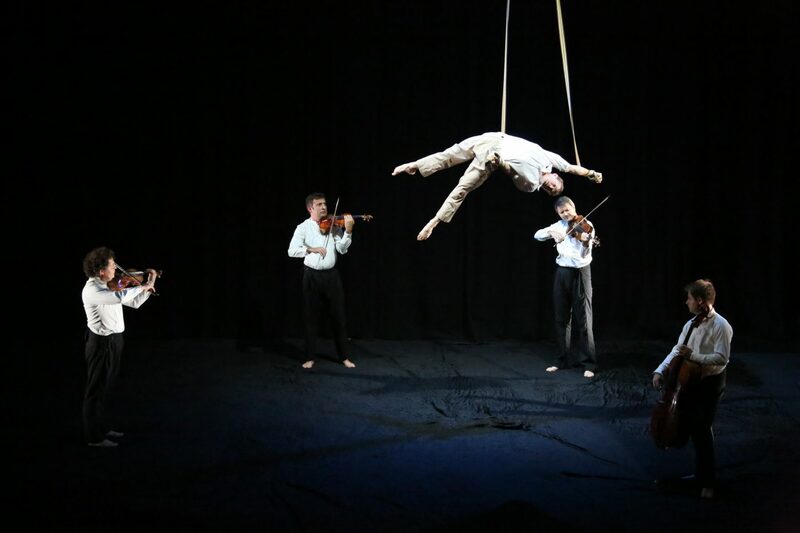 For Opus, the world-renowned Debussy String Quartet appears onstage with the acrobats, accompanying their movement and becoming part of the action themselves. One of the best in their field, the Debussy String Quartet is well-versed in cross-medium collaborations. Their repeated partnerships with Compagnie Käfig meld dance, boxing, and classical music, putting the quartet at the “crossroads of two universes”. The success of such collaborations is indicative of the incredible synergy that lives between music and movement. With a background in opera, it is no surprise Circa’s Artistic Director Yaron Lifschitz would have an eye for such collaboration. Whether incorporating four string musicians or two opera singers (Il Ritorno), his concepts capitalize on the additional immediacy and nearness live music brings. In Opus, no elaborate costumes or set pieces are needed – the thoroughly affecting piece is created solely by the interplay within the quartet, between acrobats, and across the complimentary worlds of music and movement. This simplicity is the basis for Circa’s “revolution in the spectacle of circus” (Les Echos). Shostakovich’s String Quartet No. 8 is the perfect selection to highlight this partnership: it is urgent, bleak, angular, and always moving. Shostakovich is also known to have included circus music (as well as popular genres like jazz) in his compositions. The composer famously declined characterizations of his music as supporting revolutionary narratives – similar to the way Circa distances its shows from concrete storylines, preferring instead to convey a theme, an emotion, a mood. Like the margin of silence that follows an engrossing piece of music, captivated silence speaks the loudest praise for displays of physical and musical artistry. Towards the advancement of contemporary circus as a serious, affecting art form, Lifschitz endeavours to ground the addictive spectacle in the more authentic elements of movement, feeling, and human bodies. When this approach meets live music, nothing compares. This is circus like only Circa can imagine. Taryn Plater is in her second year working as Marketing & Communications Assistant at the Chan Centre as part of the UBC Work Learn program. She is pursuing a double major in music and linguistics at UBC, as well as a Master of Management, and is passionate about expanding the role of the performing arts in our society. Circa: Opus will be at the Chan Centre on Saturday April 28, 2018 at 8pm.